Submit your assignment as Dance Ballet – Final Exam. Remember to include your HOL Name, HOL ID and House at the top of your e-mail, and please don’t send your homework as an attachment. Thank you!!! ​Your time to perform has finally arrived! 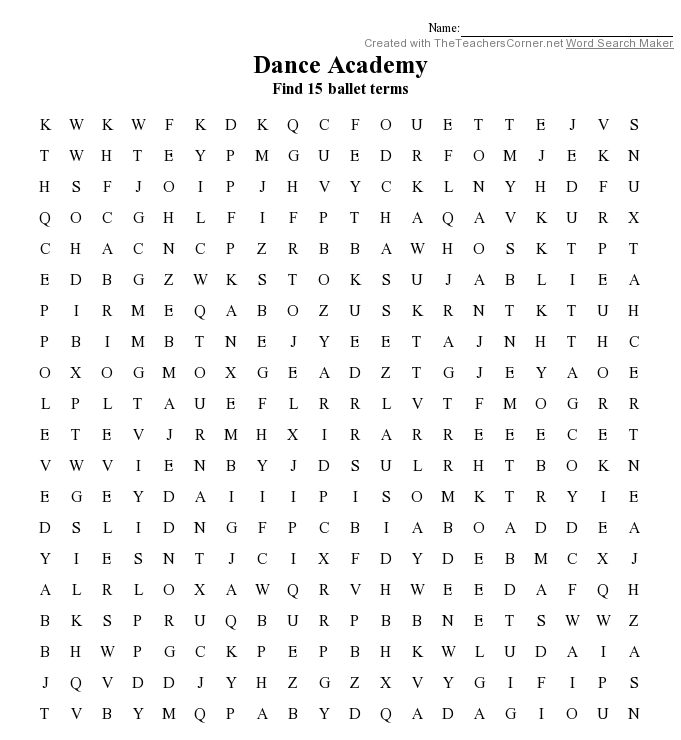 In order to practice a little bit more your choreography and technique, find in the following Word Search 15 terms related to the ballet concepts you learned this term. Send a list with the words you found. Good luck!! If it is easier, you can also download the puzzle from the file I'm attaching! Match the following events/terms with their correct ballet. Send your answers as 1-A, 2-B, 3-C. These are not necessarily the correct answers! 1. Produced everywhere in the world by Christmas time. 2. The story starts when Julian Craster, a composer looking for recognition and success, attends to a ballet presentation and finds out that his music is being used without his permission. 3. The story of a boy who wants to dance ballet but fears the reaction of his father. 4. Originally planned as a two acts ballet, but later it was changed to 4 acts. 5. Considered a derivative product of the water-nymph mania that was occurring at that time. 6. Based on the story written by Hans Christian Andersen. 7. Prince Siegfried, Odette, Odile, Von Rothbart. 8. A celebration of sweets is an important part of this ballet. 9. Casting the role of the protagonist was extremely difficult. 10. This story involves secretly taking ballet lessons. 11. Tchaikovsky died less than a year after the original production of this ballet. 12. It also inspired a musical theatre version! 13. The protagonist didn’t enjoy participating in this ballet. 14. At first this ballet was unsuccessful because dancers thought that Tchaikovsky’s music was too complicated to dance to. 15. At first this ballet was unsuccessful due to the story and production, but the music was well received.